Built from wood, stone or brick, the heritage sites included in this tour reveal the importance of education in South Australia’s past. Visit the Mitchell Building on North Terrace, notable as the first building constructed for the University of Adelaide. Stroll past the Advanced School for Girls on Grote Street, a fine example of Gothic style architecture. Also take in The City Model School on Sturt Street, a public school which opened in 1883 and now known as the Sturt Street Community School. These building for the most part have to be enjoyed from the outside as they are in current use and not generally available for public viewing. 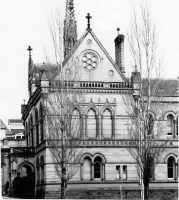 Exceptions are the buildings which are part of the University of Adelaide and the Destitute Asylum Schoolroom which is now part of the Migration Museum.